In the last few years, there has been a small but discernible concern about the declining status of solo dancing in Odissi, Orissa and beyond. For instance, while the Srjan institution has been organizing an annual festival (Marga Darshana) featuring solo male dance performances only, the Mahari festival, an annual show has prominently featured solo dancing in the classical Odissi genre. Such efforts are always welcome, commendable, and definitely the need of the hour. The ODA has added a feather to its cap. The festival was inaugurated by the Governor of Orissa, His Excellency, Sri Murlidhar Chandrakant Bhandare. The Governor has a keen and lifelong interest in the classical Arts, and his frequent presence in classical performances has set a pleasing and encouraging trend in Orissa. Also present were the venerable Odissi danseuse Dr. Minati Mishra, senior Odissi exponent Dr. Priyambada Mohanty Hejmadi, the Secretary, ODA, Guru Aruna Mohanty and Secretary, Bhubaneswar Music Circle, Khirod Patnaik. The opening performance had three items presented by Arushi Mudgal, a disciple of prominent Odissi dancer Madhavi Mudgal. The 1st item, 'Shiva Nataraja' saw Arushi delivering a performance which spoke well of her training and her preparation. The dancing, good in many parts, did however throw up a few noticeable lapses. In the 'chouka' position, her arms registered a fall distinctly below the parallel that is traditionally required. Arushi is certainly among the better Odissi dancers and at her level, this was rather surprising. Towards end of the item when the dancer was executing circular movements in the prushthadhanu paada in a quick 1-2, 1-2 tempo, the mardala player failed to stay true to the beat. This was a glaring lapse since it came at the exit point of the dancer. This piece was choreographed by Madhavi Mudgal, music was set by Maheswar Rao and the lyrics were by noted Oriya poet, Late Dr. Mayadhar Mansingh. The following item by Arushi was a frequently performed classic composition of Guru Kelucharan Mohapatra, known as 'Hamsadhwani Pallavi.' Arushi danced this item very well; her confidence and enjoyment showed a marked difference between this and the previous item. However, the mardala player Bijay Barik really needs to pull up his socks; he made a complete departure from the set bols that adorn this classic piece, and secondly he stumbled at the tihai at the conclusion of the item. Some new foot work has been added to the original choreography, and while these were dexterously executed, one wonders if a classic composition by a legendary guru should not be retained fully in the original. For example - in the original Guru Kelucharan's composition, there is a beautiful rhythmic passage where the Ektali (four matras) is superimposed by Jati taala (fourteen matras) using the syllables 'drim ta tanana tadrimta tanana, tananana direna ta drim ta direna,' some new footwork was seen. Similarly, new footwork has been introduced in the tihai at the exit point. The music for this piece was composed by Late Pt. Bhubaneswar Mishra. The concluding item of Arushi's presentation was very interesting. In fact, interesting on various counts. The item was based on a traditional Oriya song (Prana sangini re) and has been a favourite of the dancer's guru and relative, the noted artiste Madhavi Mudgal. What struck the reviewer was the faithfulness and detail with which Arushi has absorbed her guru's style and even movements. Actually, it appeared as if Madhavi Mudgal was dancing on stage. While this is a happy consequence of the guru shishya bond, I, personally would hope that, in the coming years, Arushi would develop her own distinct identity in her evolution as an artiste. She certainly has the potential to evolve into an excellent dancer. The choreography was by Guru Kelucharan Mohapatra and the music for the song was composed by Pt. Bhubaneswar Mishra. The other interesting aspect was the introduction of a useful tool - the dancer explaining the abhinaya prior to the dance. This device, used to communicate effectively with any kind of audience, is a welcome innovation in the performance design - the credit here must be given to the festival designer and well known danseuse Smt. Aruna Mohanty. I recall that this device was frequently used to great effect by Odissi's pre-eminent dancer, the Late Smt. Sanjuta Panigrahi. In Arushi's case, the dancer who has taken pains to learn the Oriya language, conveyed the details of the abhinaya eloquently. In Jaydev Bhavan, Bhubaneswar however, there seems to be a cloud in every silver lining! The cordless microphone that Arushi was using for this demonstration, misbehaved so badly that quite a bit of what Arushi said was not audible since the microphone had died on her!! Unfortunate for Arushi, unfortunate for the audience. The next performance was by Bijay Sahoo. In spite of all the training, practice and preparation, a prerequisite for any good performance is the dancer's involvement with the subject that is being performed. And in spite of being a capable dancer, Bijay Sahoo seems to be reluctant, often, to measure up to this fundamental demand that classical art makes on the performer. In the Ragesri Pallavi that he presented there were frequent drops in the firmness of the body line; the energy with which he started appeared to dissipate at the middle and the end of the item. There is no doubt that Bijay Sahoo has the potential to become a first rate dancer. He needs to, however, analyse along the lines of body firmness, exaggerated thrusting out of the chest, and the necessity of maintaining the energy level throughout the performance. This would help him to avoid the mechanical look that the performance gave out. This piece was choreographed by Guru Gangadhara Pradhan and directed by Guru Aruna Mohanty. The music was set by Guru Ramahari Das. The second item by Bijay Sahoo, an abhinaya, was an enactment of the Valmiki Ramayan using the 3 prominent characters - Sita, Hanuman and Ravana. Here the inadequacies of the musical composition hardly gave any support to this very emotive choreograph drawn from the rich mythological characterisation of the Ramayana. There was, however, a place where the music redeemed itself - in the refrain 'Jai Ram jai jai Ram,' the tune had a lilting quality and a devotional fervor that lifted the ambience to another level and had the audience swaying. Good work here. Bijay Sahoo's depiction of the 3 mythological characters lacked definition: the solo dancer should have the unerring capacity to delineate the characters, especially mythological characters, with a clarity that communicates easily and unambiguously to the audience. Further, the singing of the Sanskrit text by the normally tuneful Rupak Kumar Parida lacked the clarity and intonation that Sanskrit is known for; the bad microphone also played its part in making the enunciation foggy. It must be said, however, that in spite of all these shortcomings, there were flashes of brilliance in Bijay Sahoo's performance - an improvement along the lines suggested certainly has the potential to draw excellent performances from this promising dancer. A good choreography always depends upon the dancer to bring out its inherent strengths. The choreography was by Guru Aruna Moanty, the music by Sukant Kumar Kundu and the rhythm composition was arranged by Bijay Kumar Barik. The concluding part of the evening was easily the best presentation of the two day festival and the dancer Ayona Bhaduri was, by far, the outstanding artiste. She excelled in all aspects of dancing - grace of movement, clarity of mudras, good rhythm sense, miming of a high order, a smooth transition from one movement to another, good stamina - all of which revealed a complete understanding of dance and excellent preparation. Her first item 'Charukeshi Pallavi' was a fine example of a good dancer being able to lift the choreography to an unexpectedly high level: this would not have been possible for an inferior dancer. 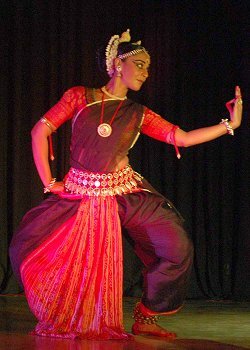 The composition of the Pallavi was a little unusual - almost half the length of the Pallavi had no rhythm accompaniment - but the dancer showed no discomfort in traversing this passage. The choreography by Guru Sharmila Biswas used a few steps and movements which were alien to classical Odissi but their placement and execution jelled well with the subject. The music for this item was composed by Debashis Sarkar. The second item danced by Ayona was an abhinaya titled 'Katha Surpanakha' - a choreographical tour de force by Guru Sharmila Biswas. The story is drawn from a variety of sources - 'Dandi Ramayana,' Baidehisha Bilasa,' 'Bichitra Ramayan,' 'Valmiki Ramayan' - and presents four characters in the form of Ravana and 3 nayikas named 'mugdha nayika,' 'avisarika nayika' and 'khandita nayika.' The switching of roles was done by the dancer seamlessly and overall, her dancing brought out the intensity as well as the sensitivity of the choreograph. Ayona's passionate dancing gave me the feeling that somewhere the dancer's real life experiences have found their way into her dancing - an impact both sharp edged and deeply moving. The music composition by Prafulla Kar had a distinctly Oriya feel about it and did an excellent job in supporting this vibrant choreograph. Prafulla Kar's music was rearranged by Surmani Ramesh Chandra Das and the original rhythm composition by Guru Dhaneswar Swain was redesigned by Bijay Kumar Barik. The second and concluding day's programme was inaugurated by poet Rajendra Panda, veteran Maradla Guru Banamali Moharana and renowned dancer Kumkum Mohanty in the presence of festival host Aruna Mohanty. The opening item 'Debagandhari Pallavi' presented by Lingaraj Pradhan started with a Mangalacharan style flower offering which added a nice touch to the performance that followed. Overall good and competent dancing aided by graceful movements, good footwork and good stage coverage. However, in the 3rd stepping of 'chouka' (in the 1-2-3 beat), the torso movement of the dancer was surprisingly rigid and surprisingly at a variance with the dancer's normal fluidity of movement. Coupled with this, a frequent use of the 'abhanga' stance gave a strange and unfamiliar mood to the Pallavi. The feeling registered was one of something new and alien, but something which one could not come to grips with. The mood of the Pallavi was further shaken by the mardala player whose harsh and loud playing style seemed to engage the dancer in battle, instead of vibing easily and gracefully with the dancer and his excellent footwork. The piece was choreographed by Guru Bichitranada Swain, music composed by Guru Ramahari Das and the rhythm composition was by Guru Dhaneswar Swain. The second item, an abhinaya titled 'Karna banama Krushna' was based on a poem by Rajendra Panda. The mythological content of the piece provided the dancer with an unbridled license for exhibiting warfare. On entry, Lingaraj kept shooting arrows at a pace and frequency far longer than aesthetically necessary. His need for overkill was also seen previously when he was describing the abhinaya. In a speech which was too long and punctuated by too many grand statements and too many mannerisms, he seems to have abandoned the need for precision. Having said this, I have to stress that Lingaraj is indeed a very good dancer and in this abhinaya he demonstrated that he was on sure ground. There was power and confidence in the dancing, the subject was suitable for his style and a fair amount of thinking and preparation was evident in this presentation. The choreography was by Guru Bichitrananda Swain, the music was set by Guru Ramahari Das and the rhythm was composed by Guru Dhaneswar Swain. The second presentation of the evening was a set of three pieces danced by the young and bright Arupa Gayatri Panda. It was a pleasure to see someone taking such care about her costume, make up and stage presence. The first two pieces were 'Panchabhuta' and 'Barsha Barnali.' The gift of expression needs to be matched by regular practice and fitness. A good dancer, but this is precisely where Arupa slipped up a bit. When she came to an abrupt stop at the end of a brisk movement and stood on one leg, the balance needed for this stationary pose was repeatedly missing. The supporting leg was seen shaking and sometimes the body trembled with it; only sustained practice can iron out this problem. Otherwise it was a good performance with grace and beauty contributing to a pleasing stage presence and an ability to bring out the subtle nuances of the choreography. The choreography for both the pieces was by Guru Aruna Mohanty with the music composition by Guru Ramahari Das for 'Panchabhuta' and Sumanta Mohanty for 'Barsha Barnali.' The rhythm composition was by Guru Dhaneswar Swain. The third piece performed by Arupa was an abhinaya drawn from the Gita Govinda, 'Madhave makuru manini manamay.' The dancing was competent and Arupa made sincere efforts to portray the emotive depth of the sublime love expressed in this passage of Jayadev's poem. If the expressiveness was slightly under par, it was perhaps because the dancer is too young to fully comprehend the range of emotions replete in the Gita Govinda. Also in the mandatory description of the abhinaya that every dancer was required to give, Arupa's speech fell short of the style and sureness of her carefully constructed stage presence. The singing by Nazia Alam was very good and ably supported the dance: there has been noticeable improvement in her rendition. Arupa is a talented dancer and has good potential for further growth. The choreography was by Guru Aruna Mohanty and the music composition was by Dr. Subas Pani. The concluding presentation of the festival was a set of three pieces danced by Rahul Acharya - 'Chakravak Pallavi,' 'Abhinaya (Mamiyam chalita vilokya, from Gita Govinda) and 'Krushna Tandava.' 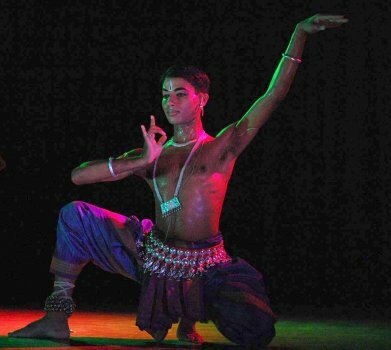 Rahul is easily one of the best among the present lot of male dancers in Odissi and the most visible face among the artistes presented in the festival. On such people, therefore, the pressure to perform at a peak level is always there, and Rahul handles this very well. The energy level was high throughout and the stamina intact from the beginning to the end. There are, however, a few things he needs to pay attention to. Rahul was sporting a set of earrings with silver chains looped around his ears. Coupled with his severe close-cropped hair, this gave his streamlined face a rather stark look. The heavy makeup also did not help matters. Finally, his reluctance to smile throughout the three items made his face more somber than it actually is; the normal mobility of his features seem to be submerged under the combined effect of the above. Since a dance performance is a total package combining many small but important things, and since Rahul has so many strengths, he just needs to look at a few things in perspective. His obvious depth of knowledge and dancing ability, and especially the obvious depth of emotion lodged inside him should translate into a more visible expression. A word about the architectonics of the footwork. While Rahul's footwork is sure and well practiced, in the Krishna Tandava and Pallavi items, the sustained fast tempo of the composition did not allow the dancer to move gracefully from one movement to another. Perhaps the burden of the choreography sat too heavily on the dancer! In spite of all this, Rahul's enormous talent and rigour carried the day. Yet again he has delivered a convincing performance. The choreography for all three pieces was by Guru Durga Charan Ranbir. The music composition of 'Chakravak Pallavi' was by Nirmal Mohapatra and the music for other two was by Guru Ramahari Das. The festival also included two seminars held in the morning sessions of the 27th and 28th March 2010, at the ODA premises. These interactive sessions named 'Bahirangam' ('beyond the body') had the express purpose of encouraging young talents to not only discuss dance but venture into the 'underlying essence' of their presentation. The audience was given the opportunity to question the dancer about 1) the choice of the item presented the previous evening, 2) whether the choice was purely the dancer's prerogative or 3) whether such choice was imposed upon the dancer by the guru. There were also searching questions about the costume, jewellery and ornaments used, the interposing of Oriya lyrics with the original Sanskrit text of Jayadev's Gita Govinda, and many questions about specific elements in various choreographs presented in the festival. Unfortunately the 'Bahirangam' sessions were frequently sidetracked by irrelevant questions and comments. Instead of drawing out the dancer's own perceptions about herself/himself and their approach to the subject danced, a few sections of the audience and some journalists present used the forum to impose their own ideas and knowledge on the dancers and the gathering. What could have been a lively 2-way communication often descended into needless bickering. Considering that the audience was composed of dancers, musicians, students, foreign visitors interested in dance, gurus and journalists, one expected a little more discipline in the proceedings. Straying from the subject (in this case the dancer's own thought process and motivation) into unrelated areas can happen in any gathering of artistes and art minded people but such straying should not become the norm, however volatile the participants may be! For instance, the argument between a male dancer and a print journalist raged on about alleged flaws in the choreography, and somehow this debate wound its tortuous way into the tribal origins of Lord Jagannath!! Strenuous attempts by the moderators to keep the discussions on track hardly had any impact on the unbridled enthusiasm of the arguing parties. Much more time could have been given to the dancers themselves and issues relevant to them. There were good intentions behind instituting 'Bahirangam.' The process of analysis can lead to newer and more novel approaches in looking at the dance and the dancers. Bitter arguments, however, need to be restrained, or at least properly directed. A few words about the compering. Srinibas Ghatuary, who normally is an eloquent speaker known for his precision, descended into a maelstrom of heavy adjectives and metaphors which unduly exaggerated the ability of every performer. Dancers will obviously write volumes about themselves but it is the responsibility of the compere to edit their bio-data! The other comperes were (themselves Odissi dancers) Nabonita Pal from USA (complete with the American twang!) and Madhusmita Mohanty, who spoke adequately but employed a great deal of effort to find the right words. Yet again, one saw the Governor being treated to snacks and beverages while being seated in the auditorium. This curious sense of hospitality has been commented upon in the past, but with little effect. If the VIPs have to be served their victuals, this ceremony can always be accommodated in the privacy of the air-conditioned visitor's room which is available in the Jaydev Bhavan. The present Governor is deeply interested in classical culture and one wonders how he feels about being served his repast in the presence of a 300 strong audience! To conclude: Aruna Mohanty frequently comes up with good and workable ideas in the service of Odissi dance. The 'Udayraga' festival is an example of rethinking Odissi - in the right direction. The effort at getting the dancers to speak, in detail, about their abhinaya presentation is an audience-friendly device which can pay rich dividends to both audience and performer.